Ask fellow campers about "Beaver Valley Campground" and nearby attractions. The owners are the nicest people. Bathroom & showers are extremely clean & well maintained. Quiet, peaceful setting with lots of shade. I would highly recommend to give this campground a visit. Has a very nice pool also! We camped at Beaver Valley Campground in a Travel Trailer. The Wi-Fi is only available by the office, not throughout the campground. You also need to get the password from the store. It did work, but only if there was not a lot of people using it. It would slow to a crawl. The campground has a gate so you will need to get the card at registration. A/C is a $3.oo add on. We camped at Beaver Valley Campground in a Travel Trailer. Moravian Tilework's is not too far away. It's an interesting place to learn about some of Pennsylvania's history. It's not expensive for a self-guided tour and you do get to meet with a ceramist. We stayed at a corner site that was level, and nice size. It had a good amount of privacy with densely wooded areas on all sides (view at back of site through sparse vegetation: well maintained seasonal site and transient tent/pop-up sites, to the left through thicker vegetation; transient site), directly in front of site playground and rally field. Site was fine stone, campground roads/walking paths rocky terrain (watch out for random ankle breaker sized rocks). Site was nicely wooded with large mature trees that offered shade throughout the day. Nice pool with clean bathrooms and hot showers just a short walk away. Good high efficiency washer and dryer. Mostly seasonals here. No Wi-Fi or Sewer, pump-out service Mondays and Fridays, $3 extra per day for air conditioner and a few extra random charges. No recycling containers-carry out cans/bottles/paper. Staff were somewhat helpful. Seasonal sites hit or miss-a lot of older/ weathered RVs.. Be sure to follow campsite directions, roads in the area are very curvy and narrow. Close drive to nice state parks. We camped at Beaver Valley Campground in a Travel Trailer. Nice, quiet, wooded campground. Sites are are little tight to get in to, but plenty of room once you're set up. The roads leading to the campground are narrow and curvy. Office people are very friendly and helpful. We camped at Beaver Valley Campground in a Travel Trailer. Wow, what a nice little campground! There's one loop for weekenders, the other two loops are for seasonal; all the seasonals we met were very friendly. We had a site by the nice playground on the edge of the rally field, which also has a full basketball court, shuffleboard court, and plenty of room for football, soccer, etc. The bathrooms are the cleanest I've ever experienced in all my years of camping! Plenty of hot water in the showers, but oddly enough no hot water in the men's bathroom sinks. Campground is located in a nice hilly area, some short grades to pull up to get there but nothing too bad. There's a beautiful creek that you can walk down to from the campground (Beaver Valley creek) that was great fun for my 2-year-old to explore. Looks like it may be good for trout fishing (not a fisherman myself, so couldn't really say). We would absolutely stay here again, and I'd even consider going seasonal here if they had a good site available. We camped at Beaver Valley Campground in a Travel Trailer. We just returned from a weekend of "old fashioned" camping. With a Saturday hayride, hike downhill to a beautiful creek, playground and card games, my children were busy all weekend. The sites across from the playground are a nice size, level with crushed gravel and with woods between sites your awning doesn't open up onto your neighbors' unit. The sites felt more private than some newer "resort" style campgrounds. The bathhouse was very clean and appears to have been recently renovated. We enjoyed are stay and are planning a return in June. It is tricky getting to the campground, just be sure to follow their map and directions. When you are looking for a quiet weekend away, this is the place. We camped at Beaver Valley Campground in a Travel Trailer. Other than having a little difficulty backing into the campsite due to the placement of trees, everything else at this campground was great. Our site was level and well-maintained with new crushed gravel. The bathrooms and showers were pristine. Since it was early in the season and the campground was not full, they did a good job of filling every other site so that groups were not on top of each other. The sites were good-sized and shaded, yet we were right across from the playground which was great for our boys. 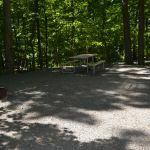 It is definitely a quiet, family-friendly campground that the owners take pride in keeping in good condition. We camped at Beaver Valley Campground in a Tent Trailer. This park was great. We had trouble finding reviews or pictures (other than the website) about this campground. We were very surprised because this campground was a Bucks County Gem. We stayed at the other popular campground in Upper Black Eddy, but this one was quiet and peaceful. The sites here were very woody and somewhat private (not on top of your neighbors). There were two bath houses, with the one by the pool house not being as modern as the other one. However, the one by the pool house was directly across from the camping cabin we rented. Usually we use our pop-up camper, but for this quick weekend trip, we opted for a camping cabin. The playground was nice and our twin 2 yr old boys loved it. The hayride was fun, the store was adequate and affordable. The game room was clean and fun. The nature trail was nice and peaceful and a great little diversion. We will definitely be back. This cg is 40 minutes from New Hope, and 30 minutes from Peddlers Village in Lahaska PA. We learned that it is only 15-20 minutes from River Country so when the boys are old enough, we are going tubing on the Delaware. Hope this helps! We camped at Beaver Valley Campground in a Campground Cabin. Nice place; mostly seasonal. The campground was quite and clean; no frills. Be careful if you use a GPS to get there. You are pretty much in the middle of nowhere and the roads can get very narrow and winding. We have a 30ft travel trailer and at times didn't think we were going to make it there. Would stay again. We camped at Beaver Valley Campground in a Travel Trailer. Are you affiliated with Beaver Valley Campground ?